In a comment on my LAST POST about the progress I’ve made toward Total Scraproom Organization, YVETTE made a very good suggestion about putting my vertical space to better use. Now, I don’t have a bunch, because my space is in the corner of the room with two big windows. But there is one wall spot with a cute house-shaped shelf with little cubbies ~ originally bought to store/display my rubber stamps. It came as naked wood and I painted it dark green to coordinate with the ‘decor’ of the room (and I use that term loosely…very…very…loosely). However, it has turned out that the spaces are not the right size for the most part so, as much as I hate to, I need to junk it (but it’s sooooo cute!) (and I hand painted it!). Good golly gosh, I’m so good at making excuses NOT to get rid of stuff & that needs to change. Like, yesterday. I saw one at Michaels the other day and was very intrigued by it’s sassiness and usefulness. However…#1 it was $80, #2 I had nowhere to hang it because my only wall already had a VERY cute little…oh, you know! But now I’m wondering if it will ever be 30% off, or if I can use a 40% or 50% off coupon. That would put it in my price range, ya know? If I remember right, I think there are two versions of this shelf and the other one is bigger with an additional cubby/section per row. Anyone have this item? How ya’ liking it? I know that Scrapperdays, for one, is rockin’ this Organization Challenge. Go check it out on HER BLOG. Yay for you! Anyone else making progress you want to tell us about? Keep going…you can do it! i started early this morning (12am-1:30am), fill a box tray -this is stuff that will go back into my Studio Niche. 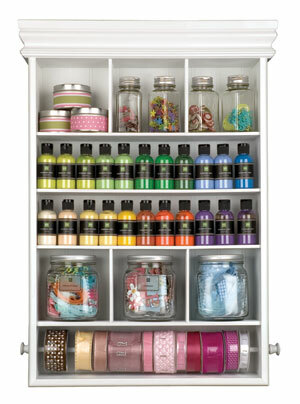 I just bought this at Michael’s yesterday – using their weekly coupon – which was 50% this week! Paid a bit over $40 for it!